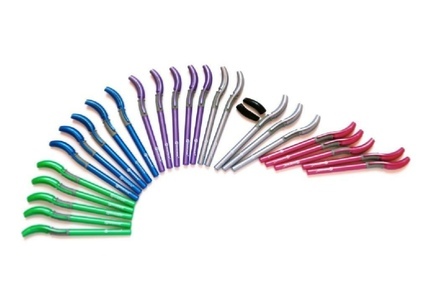 The “Swanneck” logic pen brings a logical solution to the worlds writing needs whatever language you write, ‘left to right’ as in English, ‘right to left’ as in Arabic text, ‘top to bottom’ like Chinese and Japanese. Left-handed or right handed. The writer is able to clearly see what they are writing without obscuring their written text or Letters – especially beneficial when a child is learning to write. pen can, quite literally, be a huge pain. 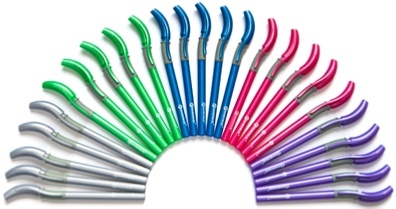 All models in the “Swanneck” Pen” range features a unique, S-bend neck and grip area. The writer can to hold the pen comfortably at a balanced angle and easily view all letters and words as they are written. Swanneck Pens don't just make left-hand writers of all ages happier and better writers. They make writing a breeze for right-handers working in Arabic and other 'right to left' languages such as those used throughout Asia. Available now as brightly coloured everyday ballpoint, and in stylish aluminium, Swanneck Pens really are something to write home about! As seen on TV: BBC's 'Points West' and ITV's 'The West Tonight'.